Ballifeary Guest House Guest HouseWe are a 4-Star Guest House offering high quality accommodation and excellent breakfasts in the Heart of the Highlands. We are conveniently situated close to the city centre and River Ness, in a quiet residential area. There is a private car park for Guests' cars. Eden Court Theatre is a short walk from us, offering top class entertainment. A Victorian Villa in the centre of Inverness, ideally situated for Business or Pleasure. Cheques accepted. Freeview TV Channels. Free Mineral Water in all Rooms. Leisure and Golf facilities are a short walk away. Children welcome from age 15. 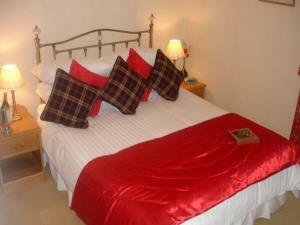 Ballifeary Guest House sometimes limits bookings to 2 or more days.